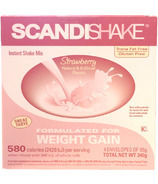 ScandiShake calorie-rich shake mix is designed to assist patients who need to gain or maintain weight. 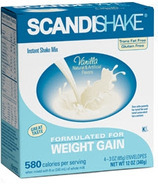 Mixed with 8 ounces of whole milk, a single serving of Scandishake contains approximately 600 calories. Available in three great tasting flavours it can be mixed with a variety of foods and beverages to help combat taste fatigue. SandiShake is gluten-free and certified kosher.